The Italian Ministry of Economy and Finance selected Magaldi Group for a meeting with the Asian Development Bank delegation visiting Italy to evaluate certain business opportunities including the STEM® (Solar Thermo Electric Magaldi) system which is a mix of high technology, research and innovation in green energy, on which the Asian Bank mainly invests. 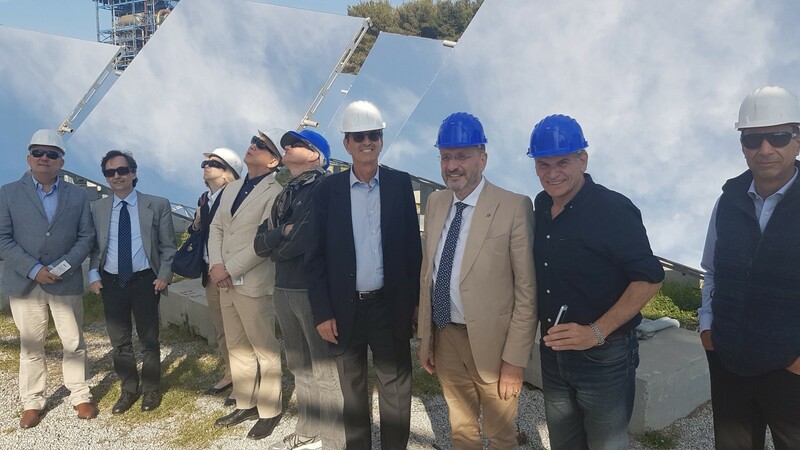 Last 23rd March, the Asian delegation visited the Integrated Energy hub of A2A in San Filippo del Mela (Sicily), where Magaldi has installed its first STEM® plant: a disruptive CSP system with TES (Thermal Energy Storage) able to collect solar energy and convert it into thermal energy to be used immediately or stored and extracted when desired. The system aims at advancing the state-of-art in solar tower technology by implementing a new heat-transfer system able to provide round the clock baseload thermal and electrical power, using easy-to-find, recyclable and environmentally safe energy storage materials. In fact, it is the first CSP system worldwide using sand (instead of molten salts) as thermal energy storage medium. A fluidized bed technology allows to store energy and supply it on demand when needed, during periods of peak need on cloudy days or even several hours after the sunset. Based on modular units that can be combined together to produce the steam flow rate needed, STEM® is able to realize generation systems of different configuration, power and capability (min. 500kWe – MAX. 20MWe). The modularity also increases the reliability of plant operation due to the possibility to ensure steam production even when a module is out of order or under maintenance. STEM® technology can be used both with a standalone configuration or in combination with other energy sources. In particular, it can be used as energy storage device supporting a new or existing PV plant. This outstanding application assumes STEM® as a device aimed at storing energy during daytime to be used after sunset, thus replacing traditional batteries still suffering from a series of disadvantages (e.g. high costs, use of pollutant and dangerous heavy metals, shorter lifetime, capacity limits, etc.). From this point of view, STEM® performs as a thermal (not chemical) battery that is charged at practically zero cost thanks to the clean energy received from the sun. Representatives from CdP, Simest and Sace also attended the visit.